4 February 2019 – Yangon, Myanmar: The largest global sports media property in Asian history, ONE Championship™ (ONE), has just announced the main event of ONE: REIGN OF VALOR, which is set for the Thuwunna Indoor Stadium on Friday, 8 March. Reigning ONE Welterweight World Champion Zebaztian “The Bandit” Kadestam of Sweden will make the first defense of his World Title against Georgiy “Knight” Kichigin of Kazakhstan. Ticket information for ONE: REIGN OF VALOR is available at www.onefc.com. Kadestam captured the vacant ONE Welterweight World Championship with a stunning fifth-round knockout of previously unbeaten American Tyler McGuire last November. 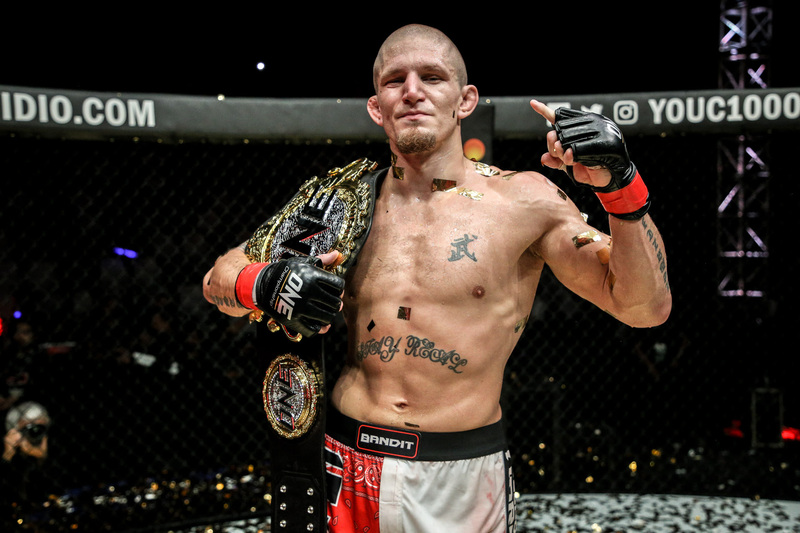 “The Bandit” took the welterweight throne by showcasing his dynamic striking skills, and now he looks to make his first ONE World Title defense against the veteran Kichigin. Kichigin is a grappling specialist who hails from Almaty, Kazakhstan. He has amassed a stellar 20-5 professional mixed martial arts record, of which 16 victories have come by submission. “Knight” is currently riding an impressive 14-bout win streak, having not lost a match since November 2014. Now, he makes his way to ONE Championship to challenge for the ONE Welterweight World Title. Former ONE Bantamweight World Title challenger Toni “Dynamite” Tauru is making his return to the ONE cage, following a short break from competition. The Finnish athlete, who is the Cage Warriors Bantamweight Champion, has been competing in ONE Championship since July 2015. Eight of Tauru’s 11 career victories have come by submission, proving his craftiness on the mat. Gary “Saint Lion” Mangat of Williams Lake, British Columbia, Canada is making his promotional debut after having competed in SFL and Brave Combat Federation. He is a well-rounded striker and grappler, and is a 10th Planet Jiu-Jitsu product. A winner of his last three bouts, Mangat steps into the ONE cage and looks to extend his win streak against Tauru on the global stage for martial arts. Bozhena Antoniyar grew up in Loikaw, the capital city of Myanmar’s Kayah State. She began training in martial arts at the age of 16, and ultimately became a two-time National Boxing Champion. In February 2018, she made her ONE Championship debut and set a record for the fastest finish in ONE women’s history with a 24-second technical knockout victory over Shwe Sin. Stepping up to face Bozhena Antoniyar is Malaysia’s Audreylaura “Ice Comet” Boniface. Boniface trains out of Sabah’s renowned Borneo Tribal Squad under veteran coach AJ “Pyro” Lias Mansor. A Taekwondo black belt, Boniface seeks her first victory in the ONE cage against Antoniyar. The Philippines’ Jomary “The Zamboanginian Fighter” Torres is looking to get 2019 off to a hot start when she faces promotional newcomer Lin “Fighting Sister” Heqin. After kicking off her ONE Championship career with three straight victories, Torres stumbled in 2018, dropping her last two contests. “The Zamboanginian Fighter,” who trains under head coach and veteran mixed martial artist Rene Catalan at Catalan Fighting System, seeks to return to her winning ways this year. But in order to do that, she will have to get past Heqin. Heqin is a 25-year-old Chinese martial arts star who is currently on a five-bout win streak. She possesses incredible power in her strikes and has registered multiple knockouts in her mixed martial arts career. “Fighting Sister” aims to make a statement in her ONE Championship debut by taking out Torres. Making his professional mixed martial arts debut is Tial Thang, who squares off with Cambodian Kun Khmer practitioner Rin Saroth, a former KWC 3 Featherweight Tournament Finalist with a 110-22 record in Kun Khmer. Saroth made his ONE Championship debut in 2015 and has since posted victories over Mission Ali and Mario Satya Wirawan. Tial Thang and Saroth will face each other in a 68-kilogram catch weight bout. Also, Myanmar rising star Phoe “Bushido” Thaw returns to action to face “The Iceman” Yohan Mulia Legowo of Indonesia. Phoe Thaw, a Lethwei practitioner, burst onto the scene in impressive fashion. He won his first six mixed martial arts contests, five of which by knockout in the first round. Last October, he suffered the first setback of his career and now, he is looking to get back on track with a win over a veteran martial artist. Legowo, on the other hand, is a pioneer of Indonesia’s mixed martial arts scene, having competed extensively in a local promotion before making his way to the global stage of ONE Championship. “The Iceman” aims to prove that his veteran experience will reign supreme against one of Myanmar’s favorite athletes. Additional bouts at ONE: REIGN OF VALOR will be announced at a later date.